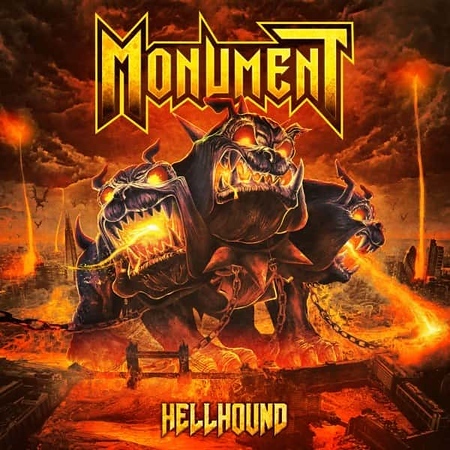 “Hellhound” is the third album from British metal band Monument (not to be confused with British progressive metal band Monuments) and it was released on 25th May through Rock of Angels Records (ROAR). The band was formed in 2011 by vocalist Peter Ellis and the previous albums were released in 2014 and 2016. Ellis is the only member of the original line-up remaining, although both guitarists have played on all three albums. I included the single “The Chalice” on the Friday NI Rocks Show on 1st June. Monument formed in London in 2011 and there were quite a few line-up changes in the early days. The band’s first EP called “Rock The Night” was released in 2012, followed by the debut album “Renegades” in 2014. By the time their second album “Hair of the Dog” was released in 2016, the band line-up had stabilised and it remains the same on “Hellhound”. Monument are Peter Ellis on vocals, Lewis Stephens and Dan Baune on guitars, Daniel Bate on bass and Giovanni Durst on drums. The album was produced and mixed by Tony Newtown who produced Iron Maiden’s “The Book of Souls: Live Chapter”.